"You can only tell them apart by their eyelids"
Beijing – A Chinese mother who gave birth to identical quadruplets several years ago, has come up with a rather ‘ingenious’ way to tell them apart. Tan Chaoyun from Shenhzen, China, decided now that her four identical boys were headed for school, it was time to do something so that teachers and other students would have it easier to know who is who. “They really are very identical, even for me,” said Tan. 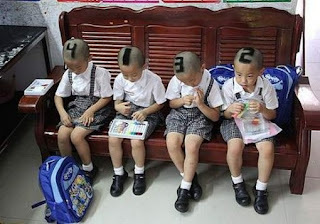 As such the mother of the quadruplets shaved off the boys’ hair except for a portion that now reads the numbers 1 through 4. The mother says, her boys are so identical you can only tell them apart by their eyelids. Considering that’s nearly an impossible task for teachers, ‘tagging’ her boys with a shaved number on their heads, is a simple but effective solution, according to Tan.